Please call us for an accurate quote on our tent rentals. Traditional pole tents utilize aluminum center poles to support the weight of the vinyl tent top. Ratchet straps are tied to stakes around the perimeter of the tent to create the tension to tighten and secure the tent. 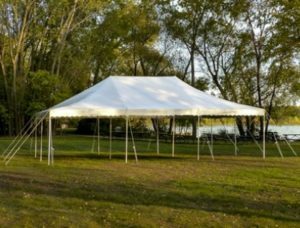 Traditional pole tents are usually have a flat top from the outside, they are available in sizes from 20’x20′ to 100’x250′ and are typically used for festivals, backyard parties, and tent sales. High pole tents are high peak tension tents with smooth, flowing interior space, and futuristic curves and peaks on the exterior. The dramatic peaks of the Century style tents are created by tall aluminum poles lined up in a single or double row on the inside of the tent, depending on the width of the tent. These beautiful tents are available in 30′, 40′, 50′ and 60′ wide, and up to 300′ in length. They are most often used to cover wedding ceremonies and receptions, galas, fundraisers, and events that require that extra touch of sophistication. 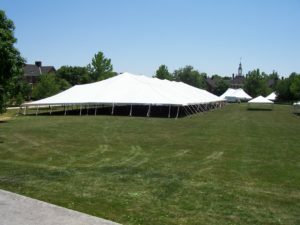 Sailcloth pole tents are most notable for their unique appearance. Instead of the traditional vinyl material, these rustic tent tops use a wide variety of natural fibers. During the day, the translucent tent tops require little lighting as they allow the perfect amount of sunlight to shine through. At night, the translucency allows the interior lighting to create a glowing effect.This tent is perfect for an intimate wedding or private event. 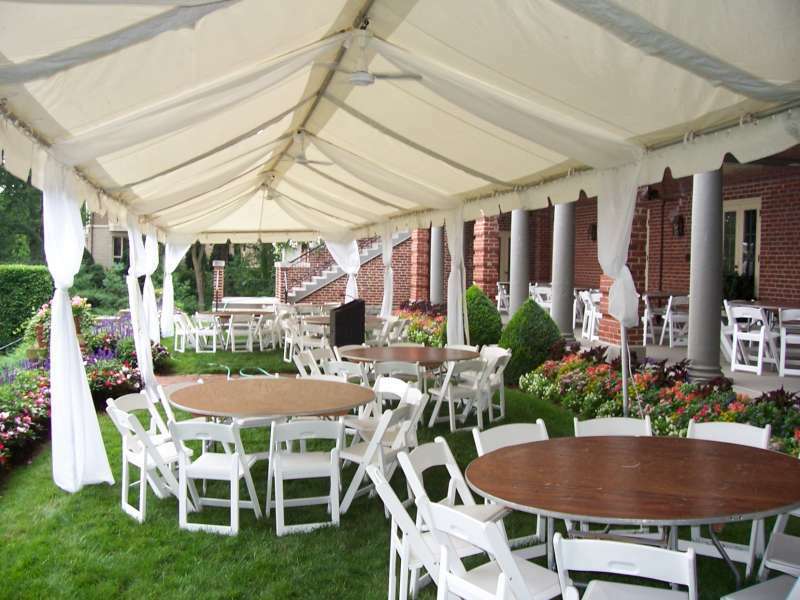 Clearspan structures are engineered, extremely sturdy, and are assembled with box beam aluminum “a” frames. The heavy duty coated vinyl top and sides are fed through tracks in the frame system, making them the most resistant to inclement weather situations. These structures are perfect for all types of events, from corporate functions, to weddings, and are ideal for long-term installations as they require no maintenance once installed. Clearspans are available in sizes from a 30’x20’ to larger than a football field! 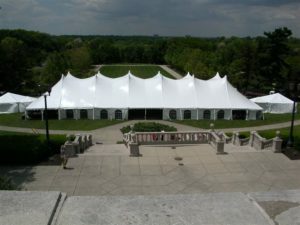 Navi-trak frame tents are constructed of aluminum framework that supports the vinyl top, providing a versatile tenting solution, with the option of being secured with stakes in the ground, by using large weights at the base of legs or a combination of these methods. 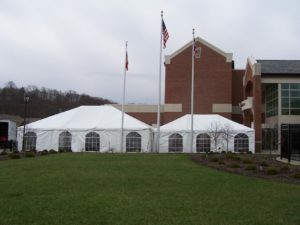 Frame tents provide unobstructed space underneath, as they do not have any poles in the center. 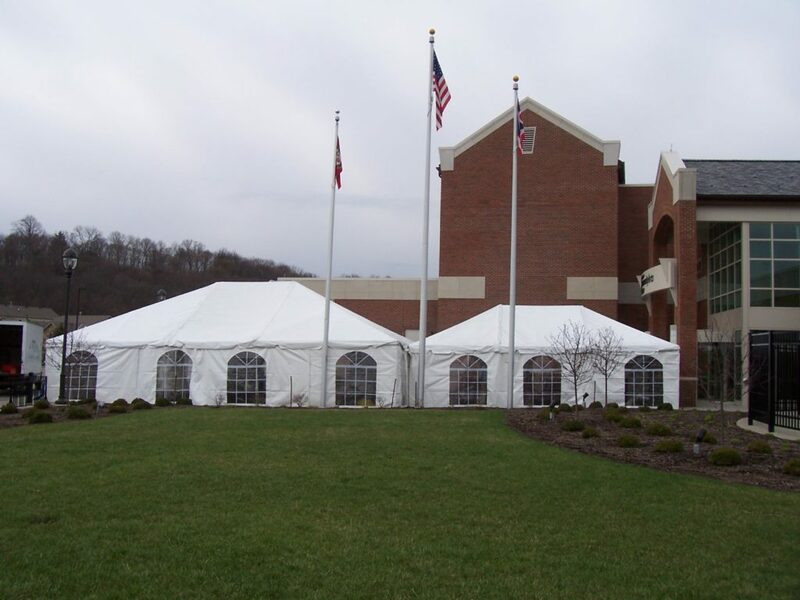 These tents are available in sizes ranging from 20’x20′ to 30’x200’. 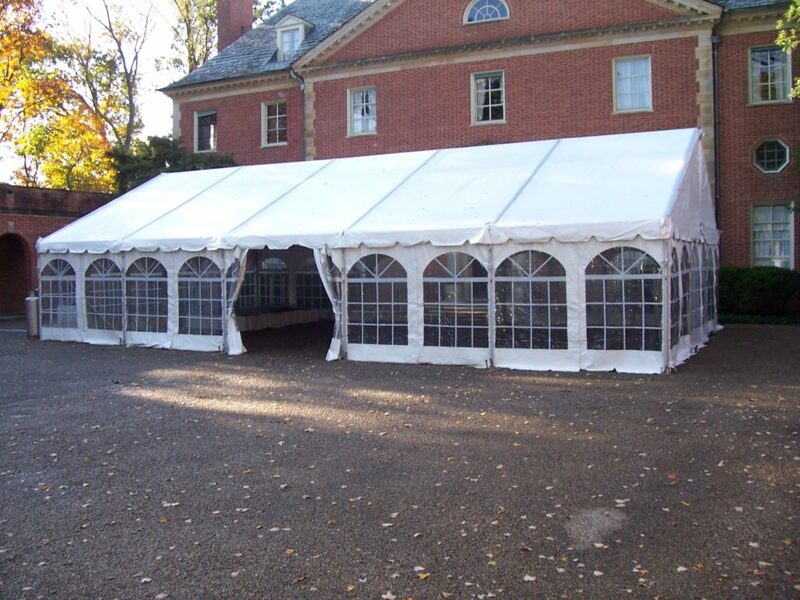 Frame tents are constructed of aluminum tubing framework that supports the vinyl top with the option of being secured with stakes in the ground, tying off to weights or a combination of the two. They have no poles in the center and are available in sizes ranging from 10′ x 10′ to 30′ x 150′. 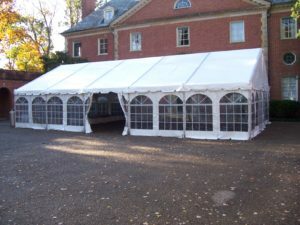 Though they are traditionally used for connecting larger tents or buildings, walkway frames are very similar to canopy frame tents. Both are constructed of aluminum tubing framework that supports the vinyl top with the option of being secured with stakes in the ground, tying off to weights or a combination of the two. They have no poles in the center, but are limited in size. They are available in either 9′ or 10′ wide and can be extended over 200′ long. Booths are the cornerstone to any festival but they also act as great vendor tenting for races, conventions and anything in between. 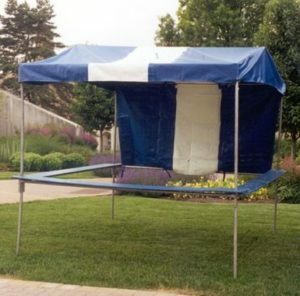 Sturdy and reliable, these tents require no anchoring and are available in multiple colors. 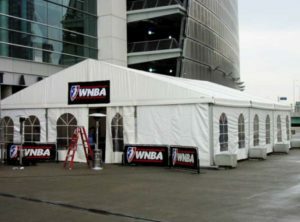 Though they are built as 10’x10′ single tents, they can be combined to create 10’x20′ or 10’x30′. 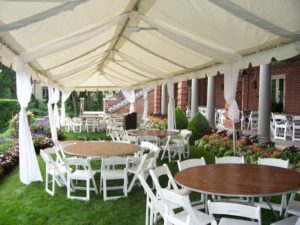 DIY tents, or Dining Fly tents, make a great addition to private events like birthday and graduation parties. They can be delivered with your rental inventory or you are welcome to pick up at our showroom for greater flexibility. Keep in mind that the 20’x20′ tent requires about a 30’x30′ space for staking and the 20’x30′ tent requires about a 30’x40′ space for staking. These tents also must be completely staked in grass. Call our event specialists if you need help deciding which size will best accommodate your guests.